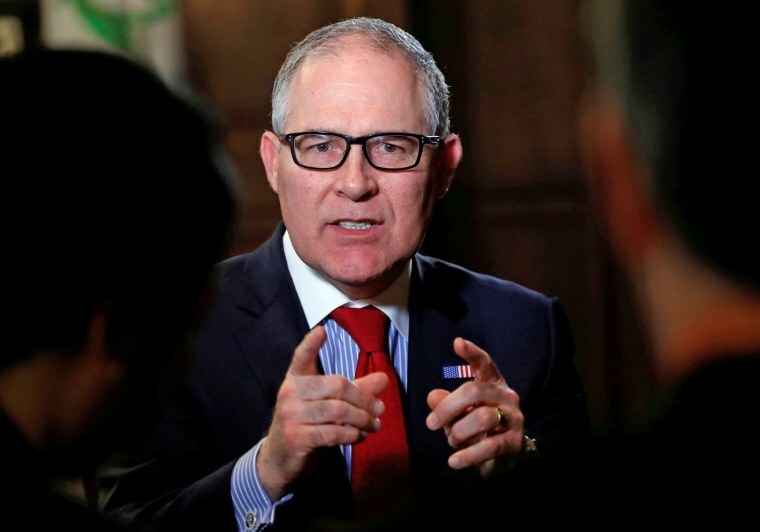 WASHINGTON — Senate and House Democrats Thursday laid out a litany of accusations against EPA Administrator Scott Pruitt, including new details of careless spending habits with taxpayers' dollars and a disregard for government policy by violating limits on official travel. The Democrats who signed the letter and met with the whistleblower include House Oversight and Government Reform Committee Ranking Member Elijah Cummings, D-Md., Rep. Gerry Connolly and Rep. Donald Beyer, D-Va., as well as Environment and Public Works Committee Ranking Member Thomas Carper, D-Del., and Sen. Sheldon Whitehouse, D-R.I. They also sent a letter to Trump saying Chmielewski “painted an extremely troubling picture of wasteful spending, unethical behavior and improper retaliation against EPA staff” by Pruitt, and they encouraged Trump to continue his investigation into Pruitt’s activities. "EPA Administrator Scott Pruitt has displayed a staggering ethical blindness," House Minority Leader Nancy Pelosi said Thursday. "President Trump must fire him. Pruitt’s abuses of office are representative of an administration that uses their powerful positions to enrich themselves and their friends." Chmielewski, who split his time staffing Vice President Mike Pence during foreign travel, says Pruitt fired him for raising questions about Pruitt’s activity. He said he has first-hand knowledge of a long list of questionable Pruitt's indiscretions. Pruitt blew past an allotted $5,000 budget to redecorate his office by leasing works of art from the Smithsonian and building a $43,000 sound proof booth. Pruitt used EPA Director of Scheduling and Advance Millan Hupp as his personal real estate representative and spending considerable time and agency resources to find a home. Pruitt “100 percent” approved pay raises for favored staff even after the White House blocked the salary increases. Pruitt's energy lobbyist landlord complained over speaker phone that he never paid him rent for the condo, and that Pruitt’s daughter was scraping the hardwood floors with her luggage. Pruitt attempted to sign a $100,000 per month lease for use of a private jet. Pruitt directed staff to find reasons for him to travel home to Oklahoma on taxpayers’ dime during long weekends. His chief-of-staff was told not to attend travel planning meetings after objecting to stays at expensive hotels and costly flights. Scheduling international trips based on places he’d like to visit as opposed to where work required him to go. Pruitt paid $30,000 for private security detail. The Democrats requested 19 specific pieces of information relating to these and other instances. Six Senate Democrats, including Whitehouse, called for Pruitt’s resignation on Wednesday. Sen. Tom Udall, D-N.M., introduced a sense of the Senate resolution for Trump to remove Pruitt from office. Also on Wednesday, Republican Chairman of the House Oversight and Government Reform Committee, Trey Gowdy, requested that the EPA provide emails and documents pertaining to Pruitt’s travel and under-market condo rental from the wife of an energy lobbyist. This is the second formal request from Gowdy’s office for the EPA to provide information. Democrats, however, would have preferred Gowdy used his subpoena power to compel information that has already been requested but not provided from the agency. Additionally, Sens. Carper and Whitehouse released details from the Secret Service and the EPA’s internal security saying that Pruitt’s defense that he needed first class travel because of security threats was not justified. As a whole, however, Republicans are reluctant to pressure Pruitt or the president. Sen. John Barrasso, head of the Environment and Public Works Committee, said that he will not hold a hearing on Pruitt until the White House finishes their investigation. “I think he has done the job we’ve asked in terms of rolling back regulations,” Barasso said.